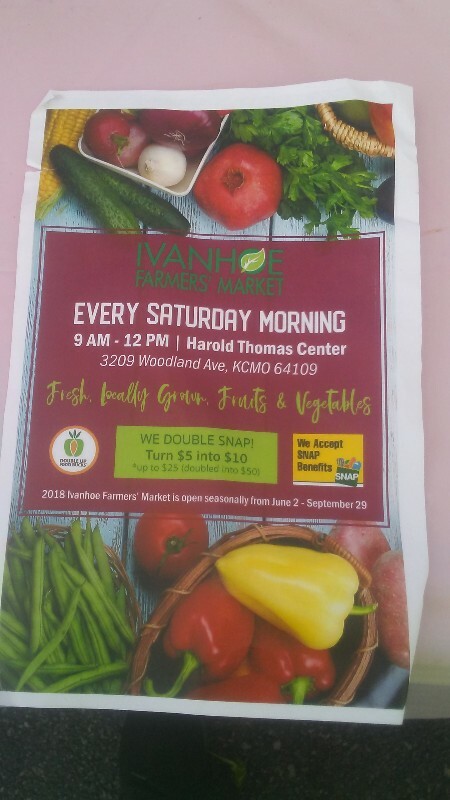 The Ivanhoe Farmers’ Market is a mission-driven, open-air, seasonal market operating in one of the Kansas City’s historic, food desert urban core neighborhoods. The market opened in 2012 as an extension of the award-winning “Grown in Ivanhoe Project”, and, since then, the market has made hundreds of pounds of fresh, local, affordable, neighborhood-grown produce available to the Kansas City community. The market mission is to provide the Ivanhoe and surrounding neighborhoods with seasonal access to local, organic food; To build a thriving community gathering space by providing safe and beautiful market spaces, local entertainment, and artisan crafts; To grow the Ivanhoe community by building a thriving network of market customers, market vendors and neighborhood growers. Our vision is an Ivanhoe community with local food on every table.